Amino acids are a crucial, yet basic unit of protein, and they contain an amino group and a carboxylic group. They play an extensive role in gene expression process, which includes an adjustment of protein functions that facilitate messenger RNA (mRNA) translation (Scot et al., 2006). The amino acids are essential components of peptides and proteins. Twenty important amino acids are crucial for life as they contain peptides and proteins and are known to be the building blocks for all living things on earth. They are used for a protein synthesis. The amino acids are controlled by genetics. Some unusual amino acids are found in plant seeds. If amino acids are deficient the protein synthesis would stop. Without alpha-amino acids human may experience fatigue, irritability, hormonal imbalances and sometimes even depression. To understand the amino acids' abbreviation, it is important to know why their names have been shorten in the first place. A reason is to make them easy to identify and to use more manageable three-letter system. For instance, the simplest amino acid, glycine is depicted as H—Gly—OH, with the «H» and the «OH» being «H2O», which represents the H2O at the time of amino acid condensing in order to form a peptide. Another way to look at the three-letter abbreviation system is that it captures the amino acid residual state, which comprises proteins and peptides. When the system was introduced, it was thought primarily to save space, rather than simplify amino acid names. It is important to know that, when one-letter system is used, such as «G» for glycine, which is more commonly used nowadays, it is referring to synthesized peptides from the coded amino acids groups. The amino acids are a result of protein hydrolysis. Throughout the centuries, amino acids have been discovered in a variety of ways, though primarily by way of chemists and biochemists of high intelligence who possessed the greatest skills and patience and who were innovative and creative in their work. Protein chemistry is age-old, with some dating back thousands of years ago. Processes and technical applications such as glue preparation, cheese manufacturing and even the discovery of ammonia via the filtering of dung, occurred centuries ago. Moving forward in time to 1820, Braconnot prepared glycine directly from gelatin. He was attempting to uncover whether proteins acted like starch or whether they are made of acids and sugar. While progress was slow at that time, it has since gained plenty of speed, although the complicated processes of protein composition have not entirely been uncovered even to this day. But many years have gone by since Braconnot first initiated such observations. Much more should be discovered in the analysis of amino acids as well as finding new amino acids. The future of protein and amino acids chemistry is lying in biochemistry. Once that is accomplished—but only until then will our knowledge of amino acids and proteins be satiated. Yet it is likely that day will not come anytime soon. This all adds to the mystery, complexities and strong scientific value of amino acids. However, the classification as essential or nonessential does not actually reflect their importance as all 20 amino acids are necessary for human health. Histidine is an amino acid that is categorized as semi-essential since the human body doesn't always need it to properly function therefore dietary sources of it are not always essential. Meanwhile, conditionally essential amino acids aren't usually required in the human diet, but do become essential under certain circumstances. For example, side chains having pure hydrocarbon alkyl or aromatic groups are considered non-polar, and these amino acids are comprised of Phenylalanine, Glycine, Valine, Leucine, Alanine, Isoleucine, Proline, Methionine and Tryptophan. Meanwhile, if the side chain contains different polar groups like amides, acids and alcohols, they are classified as polar. It includes Tyrosine, Serine, Asparagine, Threonine, Glutamine, and Cysteine. If the side chain contains carboxylic acid, the amino acids in the acidic-polar classification are Aspartic Acid and Glutamic Acid. Furthermore, if the side chain consists of a carboxylic acid and basic-polar, these amino acids are Lysine, Arginine, and Histidine. 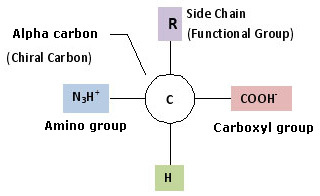 The properties of α-amino acids are complex, yet simplistic in that every molecule of an amino acid involves two functional groups: carboxyl (-COOH) and amino (-NH2). Each molecule can contain a side chain or R group, e.g. Alanine is an example of standard amino acid containing methyl side chain group. The R groups have a variety of shapes, sizes, charges, and reactivities. This allows amino acids to be grouped according to the chemical properties of their side chains. Amino acids are crystalline solids which usually are water soluble and only sparingly dissoluble in organic solvents. Their solubility depends on the size and nature of the side chain. Amino acids have very high melting points, up to 200-300°C. Their other properties varying for each particular amino acid. Only 20 amino acids are found in the human peptides and proteins. These naturally occurring amino acids are used by cells to synthesize peptides and proteins. They are typically identified by generic formula: H2NCHRCOOH. The primary difference between the 20 amino acids is a different structure of R group. Below the essential amino acids and their respective functions are shown. Glycine (G/Gly). Slices DNA and produces different amino acids. One of the three most important glycogenic amino acids. Read more about Glycine. Alanine (A/Ala). Important source of energy for muscle. One of the three most important glycogenic amino acids. The primary amino acid in sugar metabolism. Boosts immune system by producing antibodies. Read more about Alanine. Valine (V/Val). Essential for muscle development. Read more about Valine. Leucine (L/Leu). Beneficial for skin, bone and tissue wound healing. Read more about Leucine. Isoleucine (I/Ile). Necessary for the synthesis of hemoglobin. Read more about Isoleucine. Proline (P/Pro). Critical component of cartilage, aids in joint health, tendons and ligaments. Keeps heart muscle strong. Read more about Proline. Phenylalanine (F/Phe). Beneficial for healthy nervous system. It boosts memory and learning. Read more about Phenylalanine. Tyrosine (Y/Tyr). Precursor of dopamine, norepinephrine and adrenaline. Increases energy, improves mental clarity and concentration, can treat some depressions. Read more about Tyrosine. Tryptophan (W/Trp).Necessary for a synthesis of neurotransmitter serotonin. Effective sleep aid, due to conversion to serotonin. Reduces anxiety and some forms of depression. Treats migraine and headaches. Stimulates growth hormone Read more about Tryptophan. Serine (S/Ser). One of the three most important glycogenic amino acids, the others being alanine and glycine. Maintains blood sugar levels, and boosts immune system. Myelin sheaths contain serine. Read more about Serine. Threonine (T/Thr). Required for formation of collagen. Helps prevent fatty deposits in liver. Aids in antibodies' production. Read more about Threonine. Cysteine (C/Cys). Protective against radiation, pollution and ultra-violet light. Detoxifier, necessary for growth and repair of skin. Read more about Cysteine. Methionine (M/Met). An antioxidant. Helps in breakdown of fats and aids in reducing muscle degeneration. Read more about Methionine. Asparagine (N/Asn).One of the two main excitatory neurotransmitters. Read more about Asparagine. Glutamine (Q/Gln). Essential for helping to maintain normal and steady blood sugar levels. Helps muscle strength and endurance. Gastrointestinal function, provides energy to small intestines. Read more about Glutamine. Lysine (K/Lys). Component of muscle protein, needed in the synthesis of enzymes and hormones. It is also a precursor for L-carathine, which is essential for healthy nervous system function. Read more about Lysine. Arginine (R/Arg). One of the two main excitatory neurotransmitters. May increase endurance and decrease fatigue. Detoxifies harmful chemicals. Involved in DNA synthesis. Read more about Arginine. Histidine (H/His). Found in high concentrations in hemoglobin. Treats anemia, has been used to treat rheumatoid arthritis. Read more about Histidine. Aspartate (D/Asp). Increases stamina and helps protect the liver; DNA and RNA metabolism, immune system function. Read more about Aspartate. Glutamate (E/Glu). Neurotransmitter that is involved in DNA synthesis. Read more about Glutamate. This page was last updated: 18 April 2019.